UPDATE: HB2190 was not heard on the floor today – Looks like it will go tomorrow [Wednesday]. 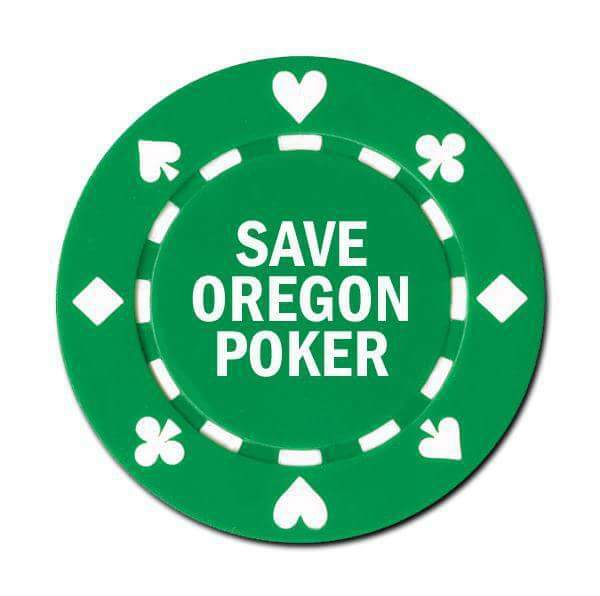 For everyone that wants to help get the word out about Social Gaming in Oregon CALL YOUR REPRESENTATIVES NOW – here is the link. Type in your address and CALL your HOUSE Rep. TODAY! Let them know you oppose HB2190 and be genuine on how you feel about Social Gaming. Also that is bill is being driving from OUT OF STATE BUSINESS. REMEMBER: Keep is short and sweet and remember we need to educate and get these Representatives on our side. Thank you everyone for being involved. I know how busy everyone is and appreciated everyone for taking the time to make theses calls and Emails. I’m trying out something new here at Mutant Poker. Utilizing the skills granted to me by computers, I’m collating information from the Hendon Mob tournament tracking site to create the Pacific Northwest Poker Leaderboard, combining players from Oregon, Washington, and Idaho (I’d include BC, but Canadian players aren’t broken out by province. It’s not going to be so much an actual leaderboard. I won’t be dwelling on the players at the top so much (Annie Duke is still at the top of the Oregon list even though she hasn’t lived here for years, to my knowledge). But when a player makes a big score, or has an exciting move up the leaderboard, I should be able to identify them and give them props. Caveats: It goes without saying that cash winnings are untracked. Reports of tournament winners to Hendon Mob are entirely voluntary (none of the Portland cards rooms do it, nor do a number of casinos in the Northwest and elsewhere). If you’ve ever listened to Limon (or me) you know buyins aren’t tracked, so high numbers in tournament winnings doesn’t necessarily indicate profitability (see Chino Rheem). While Hendon Mob tracks them for some venues, daily tournament cashes don’t count as part of a player’s ranking. Not all results are reported immediately; during the summer, Hendon Mob picks up WSOP results almost as soon as they’re on the web site, but it can take several days for venues like the Venetian to post results, and it can be longer for regional casinos. And, inaccurate results can make things difficult, whether there’s an error on the side of the reporting body or on the part of Hendon Mob. Other new names with big cashes last week were Angel Iniquez from Richland, who won one of the $200 NLHE events in Pendleton; Lacey Cole from Walla Walla with a 2nd; Richland’s Joseph Martin who final tabled the Main Event, Thanh Nguyen of Seattle with a runner-up in Omaha Hi-Lo, and Michael Curtis of Rainier for 3rd in the High Roller. I’ll mention that there is a Jose Iniquez with a first place at a Chinook Winds Deepstacks Poker Tour event from a few years back; Iniquez isn’t that uncommon a name good poker players with similar names do tend to raise red flags for me. Another big mover doe the week was Duane Miller, who moved up over 900 spots on the Washington leaderboard with four cashes—including 3nd in the Shootout and 5th in the Seniors. Tacoma’s Jon WIlliams jumped nearly 700 spots after winning the HORSE tournament at Wildhorse. Mike Turchin of Tacoma Way is still 1,212 on the Washington board, but that’s 460 places higher than he was last week. Big Money for the week goes to Ryan Dahl, the winner of both the High Roller and the Main Event, for a total of $52,872. The Main Event runner-up was Anthony Simpson, he had the third-largest score of the week (coming after Bill Patten, and including cashing in the Seniors event). Despite not working the WSOP this year, due to time constraints, I’m not going to be able to do day-by-day updates like I did a couple of years ago, but as results geg posted to Hendon Mob, I should be able to keep up on things nonetheless. Pronounced ee-la-NAY, according to the video on their About page, Ilani opened up Monday about 30 miles north of Portland, with a miles-long backup of cars on I5 heading to Ridgefield, Washington from Vancouver and points south. No poker room, so it’s of no real interest to me until they host some big tournament series (crossing fingers) but they do have some pretty card designs. Cards but no poker! I’ve been presenting archive pieces in more-or-less chronological order, but I’m going to deviate for a week because of a topic I’ve talked with people about more than once over the past week, particularly as people prepare to play the big tournaments of the summer. Everyone’s excited about the Monster Stack, the Colossus, the Goliath, the Giant, etc. Tournaments that have thousands (or even tens of thousands) of players. The gambler’s instinct is to go for those enormous prize pools. But as I laid out in “Sweet Spot” four years ago (one of my most popular posts), you’re probably better off playing tournaments with 30–60 players, because you stand to do much better if you make the money without winning the tournament, i.e if you beat just 95% of the field. Nothing announced as of press time. Battle of the Bay at Lucky Chances Casino in Colma has a $10K GTD for first tournament tomorrow, with the $100K GTD to first on Saturday and Sunday. The Cal State Poker Championship starts Friday at Commerce Casino in LA with a $50K GTD two-day tournament with a $175 buyin. Saturday at noon is The Social Experiment, the $100K GTD tournament banning hoodies, earphones, and electronic devices. This weekend, Tulalip Casino north of Seattle has a Last Sunday of the Month $30K GTD tournament at 11am. $345 including dealer added chips. Sunday at noon is Muckleshoot Casino‘s Fifth Sunday $3K added $400 buyin deepstack tournament. Two weeks from today is the Venetian May Weekend Extravaganza, featuring a $340 buyin $100K GTD tournament. WPTDeepstacks goes to central California at Turlock on 7 May for eight days including a $100K GTD Main Event. There are just 40 shopping days before the beginning of the World Series of Poker, but some of the other Las Vegas series start even earlier than Memorial Day. PokerNews has a day-by-day calendar of events at several venues starting with 25 May, showing start time, guarantee (if any), buy-in, and fees. It’s nicely laid-out but doesn’t really hold a match to Kenny Hallaert’s summer poker tournament spreadsheet which is the comprehensive source for info on Vegas offerings (and starts on 15 May, with the opening of the Venetian Deepstack Extravaganza III). Another consideration you might have is how good a structure is the tournament you’re thinking about playing? Two Plus Two poster plog has a site that evaluates tournament structures through a mathematical formula to derive something they call S-Points, and there’s a list of 2017 tournaments that have been calculated out for you. At the top end of the S-Points in the WSOP Main Event (339), at the bottom is the WSOP’s $1K Turbo Bounty (34). It shouldn’t be the end all of how you decide which events to play, but it can be another tool in the box. 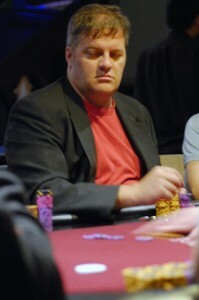 Results from the Wildhorse Spring Poker Round Up are available on their site, and local player (and a former owner of Aces Full) Bill “General” Patten had a decent weekend, taking 1st place in the Friday tournament after finishing 2nd in Thursday’s (non-High Roller) event. And I’d be remiss if I missed mentioning Max Young rocketing to the upper section of the WSOP CIrcuit Leaderboard. As of today, he’s in 4th place on the national ranking, with an even 200 points. With only three more stops on this year’s circuit (Cherokee’s already under way, Baltimore starts next week, and New Orleans is in three weeks), he appears to have a lock on a seat to the Global Casino Championship. He picked up four more cashes at the Council Bluffs stop, with three final tables and a brush with another Circuit ring, losing heads-up to the guy who’s at the top of the leaderboard. Poking at the Hendon Mob Oregon All Time Money List, for the first time in a while, I saw a name that didn’t look familiar high up. With nearly $900K in earnings, Vitaly Rizhkov sits in 8th place among the Tam Nguyens, Joe Brandenburgs, and Jordan Riches. Looking at Rizhkov’s cashes, you can see that they’re all from last spring and summer, and all from just six High Roller events at Aria. Four $25K buyins and two $50K buyins (for a minimum of $200K in buyins in the events he cashed in). He also played in the $300K buyin Super High Roller Bowl (without a cash). Coming from a mostly non-gambling family, I never set foot in a casino until a trip to New Orleans when I was 42, when my brother asked my wife and I to meet with him at Harrah’s. Since I didn’t start playing poker (again) until a few years later, my first experience playing in an actual casino was after I started the blog. Thanks, Quinault Beach! Not long after that, I won a noon game at Encore, which got me into the (then) monthly Champions Freeroll (taking second to David Moshe), and I became some sort of casino whore after my first taste of the forbidden, with unfruitful trips to Spirit Mountain and Foxwoods. The Liz Flynt Spring Poker Classic at Hustler Casino continues through the end of April. The series’ big event starts Saturday, a $500K GTD with five entry days ($350 entry). Calgary’s Deerfoot Casino Spring Super Stack starts today, with the C$1,100 Main Event (C$100K GTD) up front. Entry days through Saturday, with finals on Sunday. The CardPlayer Poker Tour has a stop at San Diego’s Ocean’s Eleven Casino starting tomorrow. It’s a $150K GTD tournament with $250 entry. The Wynn Signature Weekend $250K GTD starts tomorrow. Three days of entry ($600) and Day 2 on Sunday. Talking Stick Resort’s Getaway Classic starts Friday, with three tournaments ($200, $300, and $300, respectively). 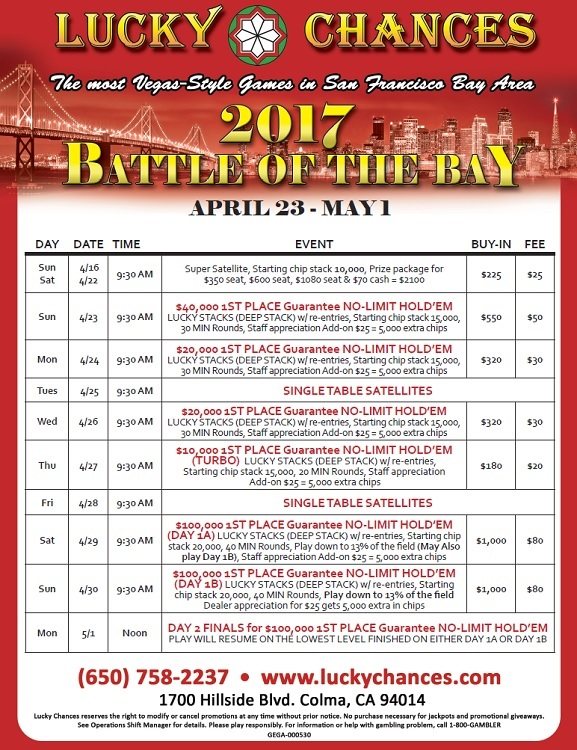 Battle of the Bay at Lucky Chances Casino in Colma starts with a super satellite to multiple events in the series on Saturday, which guarantees between $10K and $100K to the first-place finisher. Sunday is the first event, with $40K guaranteed to first place. Little Creek Casino is running WSOP package satellites Tuesdays in April at 7pm. $255 buyin plus a dealer addon, every 10 players in the tournament gets an entry to the $1,500 Millionaire Maker and $750 in travel expenses. In May, there will be four Monster Stack packages available. The Cal State Poker Championship starts next Friday at Commerce Casino in LA (see last week’s Planner). I’m a sucker for innovation, and I heard about something the other day that—even if Montreal wasn’t already one of my travel goals—would put the Canadian capitol on my radar. 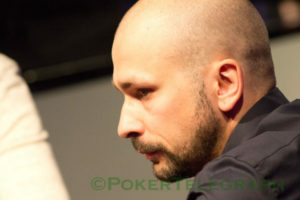 partypoker was one of the first online poker sites, but they saw the writing on the wall and pulled out of the US long before Black Friday, after the 2006 passage of the UIGEA. They have moved tentatively into the regulated US market in recent years, with a toehold in New Jersey. partypoker never left Europe or Canada however, and as PokerStars seems to have faltered since its acquisition by Amaya Gaming, partypoker has stepped up to challenge them on the live poker front. The partypoker Million North America is coming to what has become the premiere tournament venue in Canada: Playground Poker Club outside Montreal. The partypoker Million has a C$5M guarantee ($3.75M in US currency, with C$1M guaranteed for first place). The buyin is C$5,300 (US$3,980) for 1M in chips (with starting days on 5 & 6 May), but the innovative thing about the tournament is how you can buy in for lesser amounts. Yes, there are the usual mega satellites, but there are also several days of Phase I entries. From 2–4 May, you can enter a Phase I tournament for C$550. You receive 100K in chips (starting at 200bb deep) then play down to 10% of the field. Instead of survivors winning a seat and starting Day 1 with 1M chips, they start with whatever chips they’ve won in Phase 1. 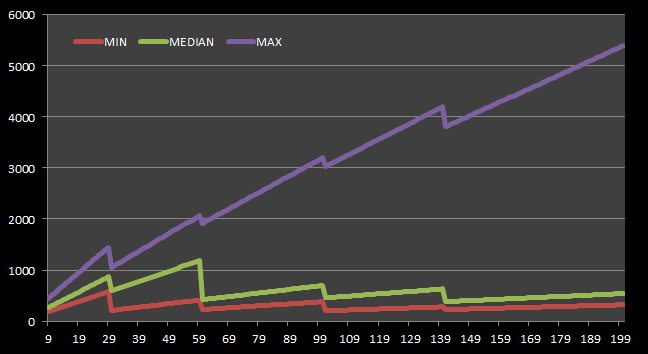 The average stack from the Phase I games will be 1M, but given the usual distributions for satellite tournaments, the median stack will be lower than that; more than half of the players will have less than the average and probably between 30–40% will actually have more than the starting stack, some with perhaps as much as 5M. It’s an exciting prospect when you buy in for 10% of the regular price. There’s even an option on 30April and 1 June to get into a Phase I for C$275 (50K in chips, with 5% of the field getting to Day 1). Nothing to do with the Wildhorse Spring Poker Round Up (which it looks like I’m going to miss this year). 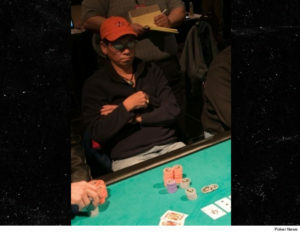 No, everyone from TMZ to the Daily Mail is reporting that the 79 69-year-old doctor from Lexington, Kentucky who was bloodily dragged from a United flight in Chicago the other day is named David Dao, calling him a “poker champ” (the Mail) who “killed it as a pro poker player” at the WSOP as the TMZ headline would have it. A little perspective might be needed, since most of these headlines were written by non-poker players. Dao is certainly accomplished, with his biggest cash over $117K for a second place finish in a 2009 WSOP Circuit Championship event with a $5,150 buyin at Tunica. But “poker champ” or “poker pro”? He took 30th place in last year’s 6,761-entry Crazy 8s WSOP event, but the $20K he got for that,—and his lifetime reported tournament winnings of $266K over 11 years—isn’t exactly doctor money, and it comes out to $24K/year before expenses. That’s getting-by money. He’ll hopefully make more from the lawsuit. 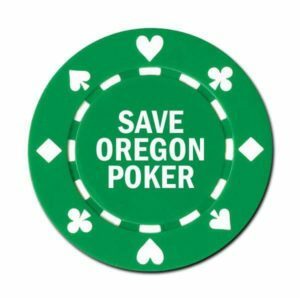 Back in the early days post-Black Friday, five-figure guarantees at Portland poker clubs were more or less unheard of, but with PokerStars and Full Tilt shut down, the clubs started catering to the newly-orphaned online crowd. May 2011 saw Ace of Spades and Aces Players Club both put on what I believe were the first above-ground $10K guarantees in town. I didn’t get close to the cash of either one; but I’d cash one at Encore Club the next month, and outright win one in November, which was for a brief time the biggest individual cash in a $10K in Portland. 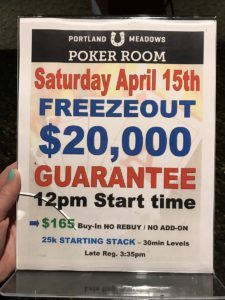 If you aren’t able to make it out to Pendleton for the Main Event this weekend—say, you’ve got family coming over for Easter dinner or some such—Portland Meadows is putting on a $20K Freezeout on Saturday at noon. $165 buyin. No rebuy, no addon and a 25K stack. closed grooving to the tunes over their headphones? Coming up at Los Angeles’s Commerce Casino at the end of the month is the 2017 Cal State Poker Championship. One of the first events on the schedule is a one-day $100K GTD tournament with a $350 buyin (29 April). No phones, hoodies, sunglasses, or headphones allowed; it’s been dubbed The Social Experiment by the Commerce Tournament Director Matt Savage and Tournament Coordinator Justin Hammer. Increasing punishments for infractions are promised, starting with 3 hands according to the structure sheet. Follow the @LAPC, @SavagePoker, and @TheJustinHammer for more. The Venetian Deepstack Extravaganza II is coming into its final weekend. Friday is the last of four entry days for a $150K GTD ($250 entry). There is a $40K GTD on Saturday ($400, 1 day) and a $30K GTD on Sunday ($300 with $100 rebuy). The Liz Flynt Spring Poker Classic at Hustler Casino continues through the end of April. Tomorrow through Saturday are entries for the $150K GTD ($175 buyin). Earlier flights on each day get smaller stacks and qualify fewer players for Day 2, and Thursday’s flights qualify more players than Friday’s or Saturday’s. Not sure what the ratioonale is for that. The series’ big event starts 21 April, a $500K GTD with five entry days. The Wildhorse Spring Poker Round-Up has been running since last weekend. Tomorrow is the High Roller and a regular NLHE even, Friday is the $340 entry, and Saturday is the Main Event start day ($550 entry). WPTDeepstacks Thunder Valley starts its $300K GTD Main Event on Friday and Saturday, for a $1,100 buyin, Day 2 on Sunday, and the final table on Monday. Calgary’s Deerfoot Casino Spring Super Stack starts in a week, with the C$1,100 Main Event (C$100K GTD) up front. Entry days next Thursday through Saturday, with finals on Sunday. The Wynn Signature Weekend $250K GTD runs 20–23 April. Three days of entry ($600) and Day 2 on Sunday. The CardPlayer Poker Tour has a stop at San Diego’s Ocean’s Eleven Casino from 20–23 April. It’s a $150K GTD tournament with $250 entry. Talking Stick Resort’s Getaway Classic happens 21–23 April, with three tournaments ($200, $300, and $300, respectively). The Cal State Poker Championship starts 28 April at Commerce Casino in LA (see above). 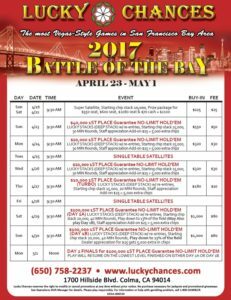 Battle of the Bay at Lucky Chances Casino in Colma starts with a super satellite on 22 April to multiple events in the series, which guarantees between $10K and $100K to the first-place finisher. See last week’s Planner. Been feeling a little beleaguered by legal attacks on Portland’s card room scene instigated by, y’know, people who want to muscle out the competition? Don’t think that you’re alone, although there may be someone with more muscle pushing back. The Ilani Casino in Ridgefield, Washington is just about to open—the Cowlitz Indian Tribe performed a dedication ceremony for the new Interstate 5 overpass yesterday—the same day that the US Supreme Court declined to hear an appeal of the case where the owners of the La Center card rooms challenged the legal status of the tribe itself in an attempt to stave off its construction. It’s hard to know whether they thought they really had a chance at this point or if it was some sort of last gasp of an effort that kept the case going. Ilani has been under construction at the cost of half a billion dollars since well before the case was up for consideration at the highest court of the land. The state of Washington doesn’t lightly undertake freeway overpass construction. And New Phoenix Casino just closed in La Center a couple weeks ago. Indications are that Ilani won’t have a poker room to start, but as the largest gaming facility within an hour of Portland (assuming you can get across the Interstate Bridge in less than an hour), its large conference area could conceivably host a regional or national poker tour stop. Everyone’s got problems this week. The Bicycle Casino was shut down yesterday after a raid in a criminal fraud investigation involving nine state and federal agencies (“Everybody wants to get into the action…at The Bike!”) According to CBSLocal, agencies involved included “the Los Angeles High Intensity Financial Crime Area Task Force, the IRS, the California Department of Justice and the U.S. Attorney’s Office,” as well as US Immigration & Customs Enforcement. 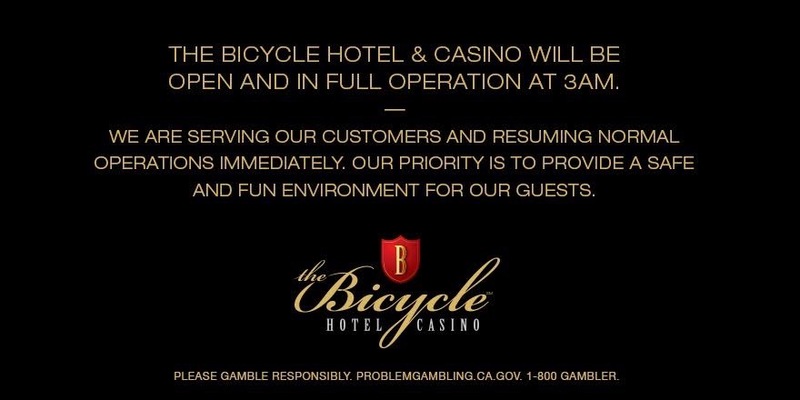 News late Tuesday says they’ll be opened back up by Wednesday afternoon, which may be good news for Christopher Sigman, who mentioned that he is supposed to be playing Thursday on Live at the Bike on the NW Poker group (it’s $5/$10 NLHE, according to the calendar, 7–10PM Pacific on Twitch and YouTube). The sixth anniversary of Black Friday is coming up in a week-and-a-half (thanks, Obama!). It happened just a few months after I started the blog, which art the time consisted mostly of obsessively noting the results of every single game I played, no matter how small. Encore Club had a $500 GTD Freeroll that day. A couple of weeks later, I had my first-ever win in a live tournament of more than two tables, at a promotional event for Portland Players Club‘s new ownership. I haven’t seen an announcement yet, but this is the First Friday of the month and there should be a $20K GTD at Final Table at 7pm, $80 buy-in with live rebuy and $40 addon. It’ll be my return to live poker after a couple of weeks off; I’ll be there with the Portland Poker Championship Series trophy! It’s the time of the year for the Battle of the Bay series at Lucky Chances Casino just south of San Francisco. BoB is a week’s worth of tournaments featuring first-place guarantees (rather than guarantees of the entire prize pool).The series gets started with a Super Satellite 22 April and runs through 1 May. There are five events in the series, with first-place guarantees of $40K (13 April, $625 entry including dealer addon), $20K (24 April and 26 April, $375), $10K (27 April, $225), and $100K (entry days on 29 and 30 April, $1,105). All events begin at 9:30am, and they’re all one-day tournaments, except for the $100K, which ends on 1 May. Lucky Chances is another casino that tends not to report tournament results to Hendon Mob, The last Battle of the Bay results they provided only included the winner’s name and payouts for 27 players, but it did show $371K for the total prize pool (so 371 entries) and what looked like the results of a deal that gave about $80K to first and $50K each to the next three players. Last November’s Gold Rush event with the same buyin had a prize pool of $461K, 461 entries (45 payouts), and a more than $15K going to 10th place with $70K at the top. It’s entirely possible to catch a morning flight to San Francisco and make the start of the tournament with time to spare; the casino (in Colma) is less than 10 miles from the airport; maybe 15 minutes in weekend morning traffic. The Venetian Deepstack Extravaganza III has two days of entry to theur $400K GTD, $1,600 entry tournament tomorrow and Friday. Little Creek Casino is running WSOP package satellites Tuesdays in April at 7pm. $255 buyin plus a dealer addon, every 10 players in the tournament gets an entry to the $1,500 Millionaire Maker and $750 in travel expenses. The Heartland Poker Tour n St. Charles, Missouri starts three flights of their $1,650 Main Event on Friday (with two on Saturday). Last year’s St. Charles Main Event (in May) had nearly $500K in the prize pool; the fall stop got over $575K. This weekend at the Liz Flynt Spring Poker Classic at Hustler Casino is a $250 buyin $250K GTD tournament with four entry days (Thursday through Sunday) and a final day on Tuesday (11 April). Peppermill Casino’s Run It Up Reno is in full swing, with the $100K GTD Main Event (600 entry) starting on Friday. The Wildhorse Spring Poker Round-Up starts tomorrow. The first real event is Friday at noon ($175 buyin), with noon events on Saturday (NLHE) and Sunday (NLHE Shootout), with Big O on Sunday night at 7pm. Elk Valley Casino in Crescent City, California has a WSOP Main Event Satellite on Friday and Saturday. There are two qualifying sessions (6pm on the 7th, 10am on the 8th), with the final session at 4pm on the 8th. Entry is $250, with 1st place receiving the Main Event seat and $2K in expenses. Maximum of 160 players. The first event of the WPTDeepstacks Thunder Valley is Friday, with a $260 buyin $100K GTD 8-Max. Entry flights on Friday and Saturday (two) with Day 2 on Sunday. Calgary’s Deerfoot Casino Spring Super Stack is back in two weeks, with a C$100K GTD C$1,100 buyin and three entry days.